UPDATE: FOSTERED! *From Christine: Kola, whose mom lost her job and her home, needs a foster home until his mom gets settled and then she will take him back. This arrangement could end up being permanent, although her original intention is to take him back when she can. Kola recently had a red growth on one of his eye removed which left him 75% blind in that eye. His other eye is approximately 45% blind. He gets along ok, but if it is dark, he does not see very well and looks for his owner and sister for comfort. 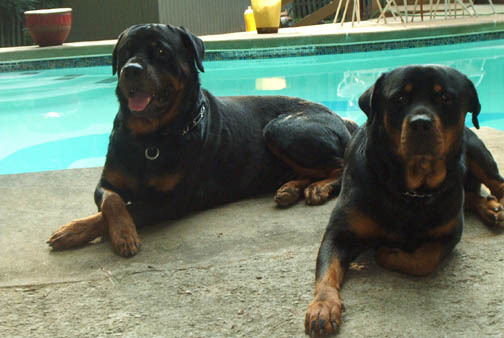 This is a note from the owner who has to give him up due to financial issues: "Kola my eldest rott is a beautiful 7 year old rott, going grey, but a very good dog. Protective and alert. Kola has never bitten anyone. Very good boy. He will love whoever loves on him, and gives him 2 doggie bones whenever he comes inside from outside. Sharon Walter." Transport and possible sponsorship can be arranged. This sweet boy needs tlc while his family gets their lives back together. These pictures show him with his younger sister and they look identical. If you look closely for the greying muzzle, that is Kola, but he is a baby who needs a new family.